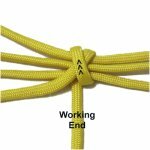 Description: The Double Loop Wrap is basically a Wrapped knot tied around two loops, which are adjustable. When you enlarge one loop, the other becomes smaller. 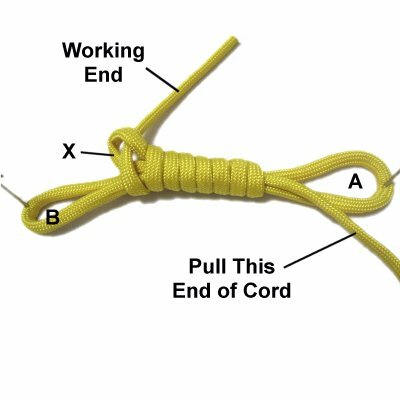 It works out better if you finish off the two ends of the cord rather than use them for other knots. 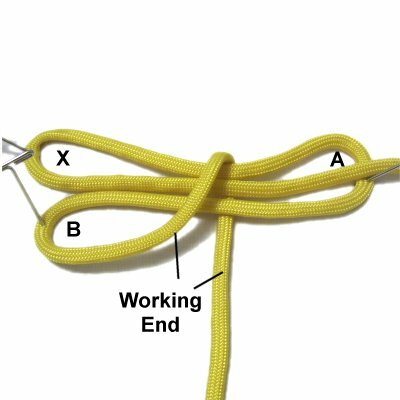 This knot design can be used for items like Macrame earrings, where you need two loops to attach hooks and beads. It's also a good way to suspend plant hangers and hanging tables if you don't want a ring at the top. Step 1: Secure a 36-inch cord on your left. Move it right, then fold it 10 inches from the secured end. Secure it at the fold, which is area A. Move it left, and fold it 4 inches from area A. Then bring it back to the right. Secure area B. Designer's Tip: The measurements stated in the instructions are for 4mm size material. The entire wrap will end up close to 4 inches. 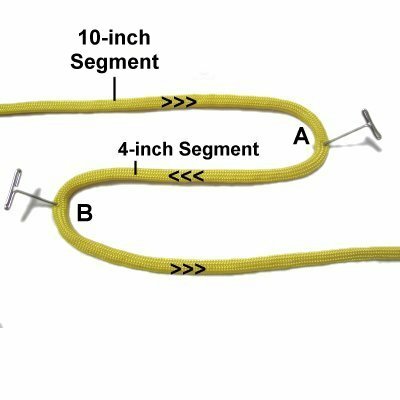 You can change the measurements to better suit the material you are using, or if you want to make the Double Loop Wrap a different size. Step 2: Move the 10-inch segment to the right, passing it between areas A and B. 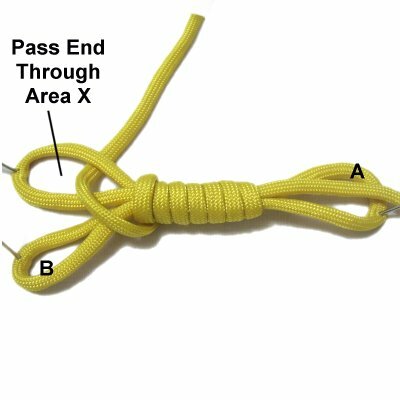 This forms a loop, which is part of the Wrapped knot. It will disappear during the tightening process. Secure it on the left, where it's folded. Mentally label it area X. 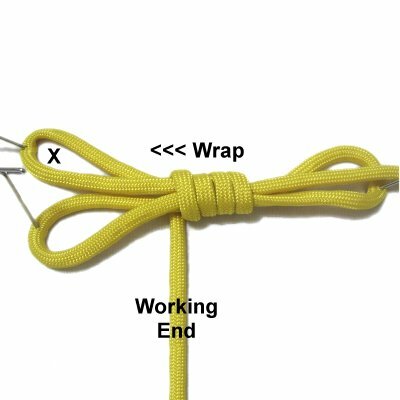 Step 3: Begin the Wrapped knot by moving the working end vertically, passing over the three horizontal segments. Move it under those segments, pulling it slightly to the right as you bring it forward. 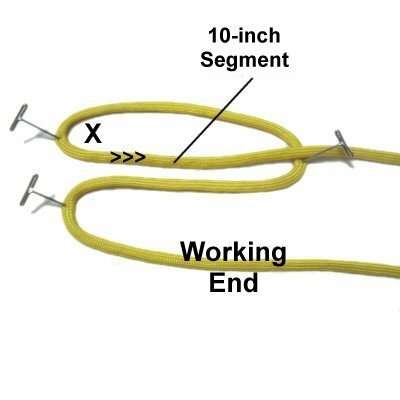 Wrap the working end around again, but move the cord on an angle to the left, so you cross over the first loop. This way the cord is in position for the rest of the Wrapped knot. Step 4: Wrap several more times, moving left towards area X. Make sure the coils are snug and do not overlap. Step 5: Pass the working end through area X from the top. Step 6: Pull the opposite end of the cord, which was the 10-inch segment. Area X will move inside the wrapped portion, securing the working end. Pull it until you can't see the loop (X). Step 7: Cut off the excess material flush with the ends of the wrapped portion. Tuck the stubs inside the wrapped area. 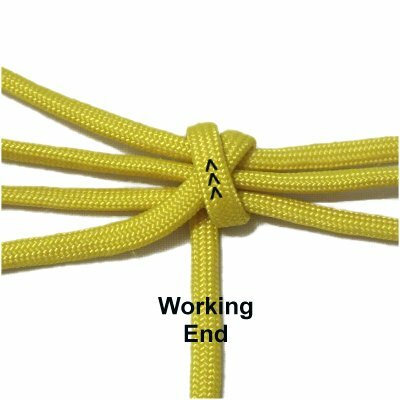 Should you decide to keep one end intact, make sure it's NOT the working end. 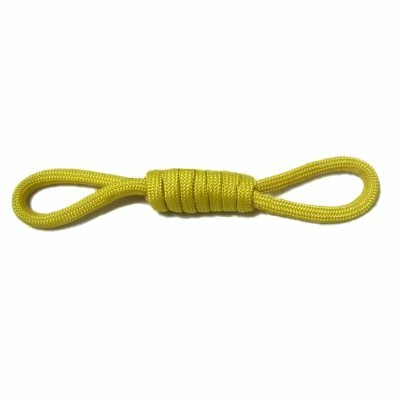 Have any comments about the Double Loop Wrap? Contact Me.